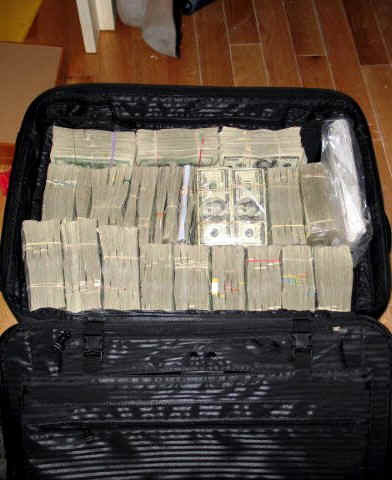 The eRumor is mostly pictures of a vast stash of American money said to total $207 million and taken in a raid on a drug dealer's house in Mexico. 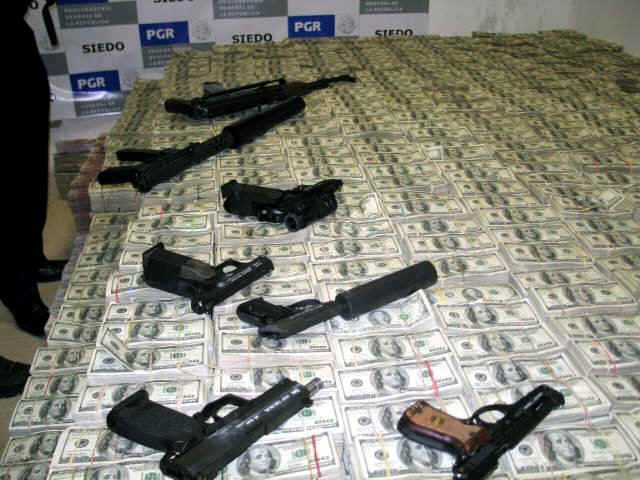 A BBC story from March 16, 2007 said the raid netted $205-million along with guns, drugs, and smaller amounts of cash in Euros and Mexican pesos. Seven persons were arrested and accused of illegally importing chemicals to make methamphetamines.Police say the raid took place in a mansion in an affluent part of Mexico City. 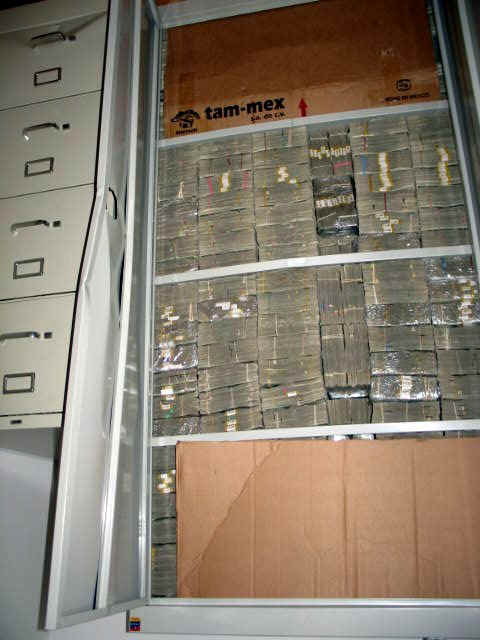 Pictures from raid of drug dealer's house in Mexico-Truth! I would think that might cover the cost of many of the illegals that have come here to sponge off the taxpayers. A whole new meaning for . . . A PICTURE IS WORTH A THOUSAND WORDS! "Seven persons were arrested and accused" - reading between the lines here; maybe I am all washed up, but..."convicted" is not mentioned in the accompanying article. Perhaps they bought their impunity with some of their ill-gotten gains? 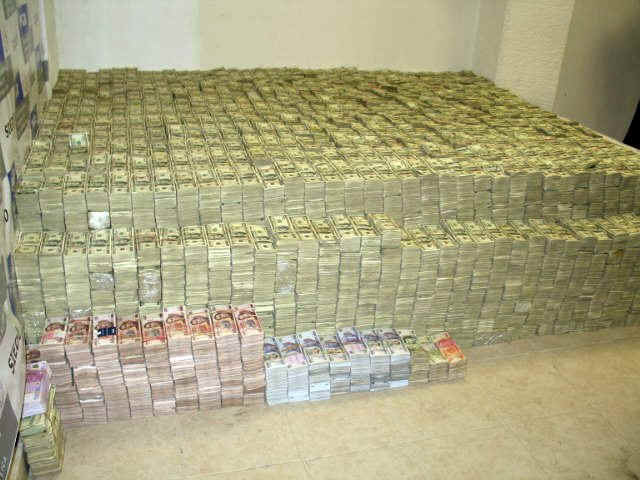 We all know how honest and upstanding the Mexican authorities are...I wouldn't be surprised if some portion of the loot is coming from the grants our nation has given Mexico to "crack down" on their drug rings. Holy moley. I will bet some of the Mexican agents were stuffing their socks. 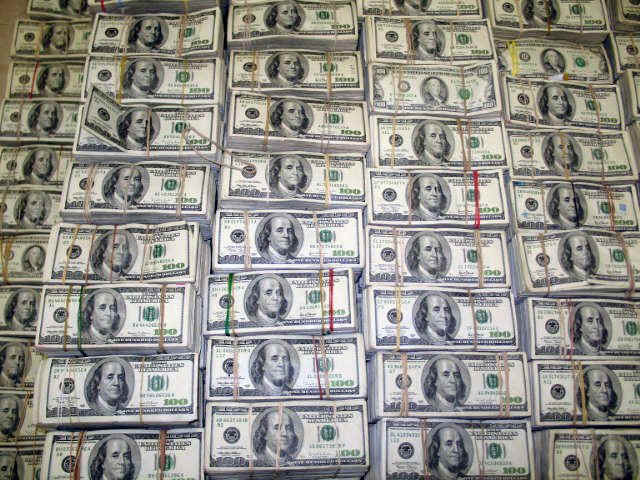 I think they should send the U.S back all our curency for payment on the behalf of the health care received by the illegals. Perhaps we should also post a picture of that idiot Amy Weinsomethingorother smoking crack. We need to get tougher on drug users here. Fantastic idea, Motley, but . . . DON'T HOLD YOUR BREATH. or at least pay for the fence across the south and guards armed with Ak-47s for a year. Yeah, and to think that most of that money probably came from AMERICANS buying drugs. You know, maybe if we Americans are so concerned, we should just stop buying drugs - but no, that ain't gonna happen. People are stupid (even here in America) and will continue doing what they are doing. Man! Better get into the speed biz!!!!! Just one more reason why we need a wall erected and the military on the border. These types of people wouldn't hesitate to kill Americans in a heartbeat.